As someone who checks out other food blogs constantly, I have a stack of recipes that I’m anxious to try and have stockpiled in my brain at all times. With so many food bloggers also doubling as professional-level photographers, how can one resist not rushing into the kitchen after seeing such works of art? I want to cook them, eat them and serve them to friends and family as soon as possible….which wouldn’t be a problem if there weren’t so many drool-inducing food blog posts out there. I mean, what on earth is a girl to do? 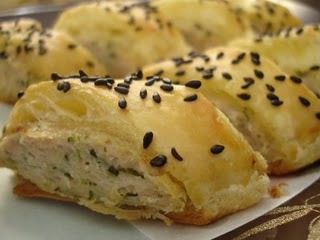 I made a teeny weeny dent in my “I-Need-To-Make-This-Now” list this past weekend by recreating Rice & Noodles’ Oriental Chicken Sausage Rolls to take to a football viewing party at a friend’s house. 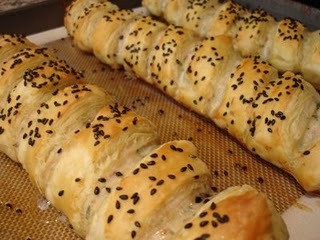 The minute I saw these golden rolls of Asian flavors I knew I had to make them. Not only were they beautiful but I could practically taste them by looking at the lovely photos. First of all, it’s a brilliant recipe. You can make a lot for little effort- everyone likes that, no? 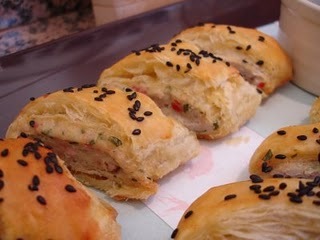 The rolls are also as beautiful as they are delicious, plus they are a nice departure from traditional sausage rolls and the element of surprise is always nice. The scent of chopped garlic, ginger, chilies and fish sauce reminded me very much of gyoza filling, and it came together so quickly and easily that I’ll definitely plan to put this recipe on my permanent list of go-to party foods. These turned out so well and were a huge hit. They really did remind me of my favorite gyoza or shumai except for the light and flaky crust which just added another element to the dish. 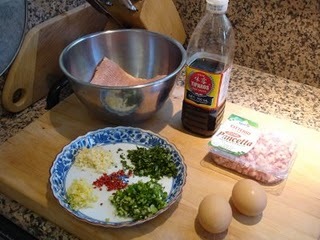 I may try adding diced Chinese sausage instead of pancetta the next time, or maybe even try phyllo dough or pizza crust. There are lots of variations that would work well with this original concept. Maybe you can whip these up to serve as you cheer on the Dodgers tonight??? 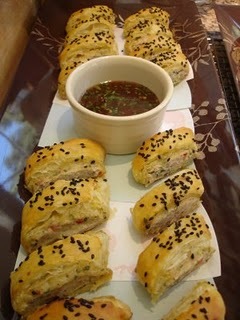 This entry was posted in appetizers, Asian food, Party food. Bookmark the permalink. I love these kinds of entertaining treats, especially beyond the usual veggies and dip or nachos (not to knock those, but they don’t have that element of surprise)! 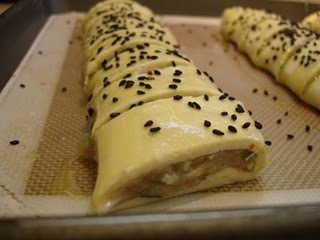 I think Chinese style bbq pork would be good as filling as a nod to the Chinese style pork buns. is it just me, or was the link to the recipe…buh… a link to something else? btw – question: you interested in hitting up a Korean taco truck? Not a taco truck owned by Koreans – wait, scratch that — it IS a taco truck owned by Koreans. But instead of serving Mexican tacos, they’re serving bulgogi tacos (and dak kalbi and spicy pork tacos) and this really cool Mexi-Korean flavored goodness. Marie: Good idea- I should try that next time! Bobblebot: Sorry about that- I just fixed the link. And yes I would looove to try Korean tacos! These look so delicious. I would love to feature them on our blog. Please email sophiekiblogger@gmail.com if you’re interested.